Specially created to embellish your flower-beds. Apply at the surface of flower beds, at the base of trees and under the edges. Reduce watering frequency by keeping soil moisture. Our high-quality, eco-friendly mulch is made from recycled tires. Its uniquely designed to resemble real wood and saves time and money by eliminating the need to top up. As a non-toxic and bio-stable product, with a ten year UV colour guarantee, its perfect for gardens, walkways, planters, around trees and more! 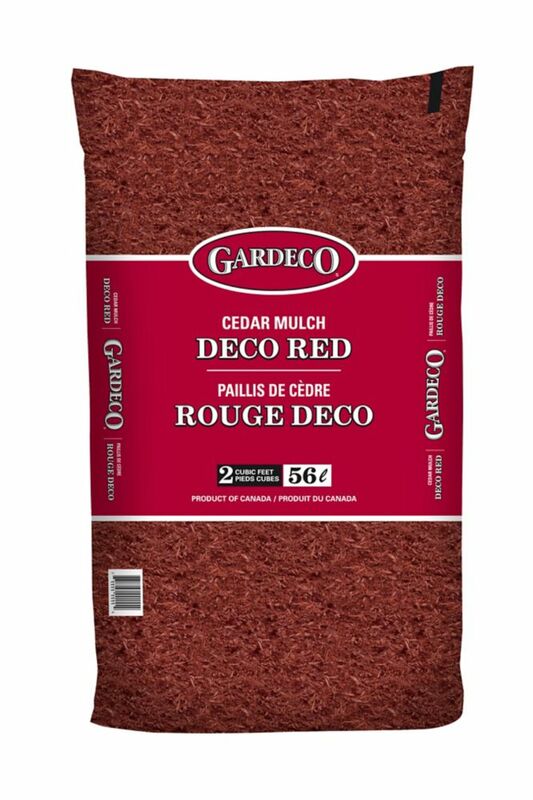 Vigoro Premium Red Cedar Mulch, 2 cu.ft. Made from 100% Canadian White Cedar, Vigoro red mulch is a 100% premium wood mulch that will protect and enhance your landscape by providing a natural and finished look. By helping create a protective barrier around your plants and over soil, Vigoro mulch will stabilize soil moisture, moderate soil temperature extremes, and will protect plants from drying out. In addition, the mulch will control erosion and moderate weed growth. 2 cu. ft. Red Cedar Mulch Specially created to embellish your flower-beds. Apply at the surface of flower beds, at the base of trees and under the edges.